Tonight is the premiere of AMC’s new Revolutionary War drama Turn, which brings new attention to the Culper Ring and espionage in general. 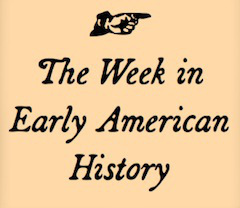 Carolyn Eastman assesses the series in this month’s Perspectives on History, while Michael Schellhammer offers a review for the Journal of the American Revolution. Ta-Nehisi Coates has been writing for the past few weeks about race and culture, and you really should read everything he publishes. This week he lets us in on his intellectual development and offers a plea for historians to engage more fully in public debates. Has it been 400 years already? John Rolfe swears in interviews that it feels like only 250. This weekend marks the 400th anniversary of the union of Rolfe and Pocahontas, and Historic Jamestowne is producing a re-enactment of the event. Did American corruption start with a 1785 gift from Louis XVI to Benjamin Franklin? The many Franklin-philes at The Junto might take offense even at the question, but Zephyr Teachout starts there to craft a long history of political corruption. Kevin Levin at Civil War Memory highlights a new article by Nicholas Marshall that questions our instinct to translate Civil War casualties into modern population terms. Municipalities continue their intimate dance/arm wrestling match with history in several news items this week. In St. Louis, archaeologists may have discovered the earliest known building in the settlement, a 1769 house built by Joseph Bouchard. Boston is putting down its marker in the continuing macabre contest to claim Edgar Allen Poe (without anyone funding the locations associated with him) with a new statue of the poet and author walking into the wind, led forward by a raven. In Philadelphia, debate continues on the design for the new Museum of the American Revolution. Construction is scheduled to start this summer. The city of Richmond, Virginia is planning a new downtown ballpark for the Richmond Braves Flying Squirrels in the Shockoe Bottom neighborhood. One little problem: Shockoe Bottom was the city’s major slave trading district in the nineteenth century. We always cheer when modern pop culture meets the past. This week, The Toast featured a commentary by Caitlin Keefe Moran on reading The Coquette, the 1797 novel that is one of the classic exponents of the seduction narrative. (Full disclosure: I assigned the text in my spring upper-level course.) Writing at The New Criterion, Laura Jacobs reviews a new ballet about witchcraft entitled Spectral Evidence. Cotton Mather could not be reached for comment. At Past is Present, the blog of the American Antiquarian Society, Caroline Sloat’s 10-year-old grandson discovers Johnny Tremain, the Esther Forbes classic about a silversmith apprentice in Revolutionary Boston. It was one of my favorites as a kid, and I’m sure that’s true for a few of our readers.